The writing community, unlike many others, is extremely supportive. Though there is competition for markets, that cut-throat competitive spirit just isn’t there. Maybe it is the often solitary nature of the work that drives us all to be nice to each other. Maybe we are all just nice people who realize that there is enough space for us all. Maybe it is even simpler than that, maybe it is just that writers are usually also readers, and many of us just can’t get enough of the written word. Whatever inspires it, the community is welcoming, to those experienced and new alike. Secrets are shared (where to send pieces, how to word queries, which person to direct submissions to) and there is a tendency to promote others’ work, as well as your own. We celebrate each other’s successes and are there for each other when things are down. We fight off the trolls together and commiserate when writer’s block strikes. We also laugh at ourselves for pursuing what is at times a rather bizarre way of life. Things that other professions would simply not accept, we take in stride as just another part of the day. These strange things we take for granted are what make us a special kind of crazy. Spend hours working on a project with no guarantee of pay. Working “on spec” is a given when you hope to break into a new market. Even when a paycheck is involved, you may not want to determine your hourly rate, especially after considering all the steps involved: the writing, promoting, billing, and keeping track of expenses in preparation for the end of year taxes. Seasoned freelancers frequently have pieces assigned to them, but if you want to choose what to write about, you will likely have to do so without the certainty of being paid. Compulsively check your mailbox (either real or virtual). Unless you write exclusively for your full time job, you engage in the process of submitting your writing for someone else’s approval. While it is easy to say “submit and forget,” that piece you submitted way back when floats in the back of your mind, so that when mail arrives, you have to immediately check to see if your answer is in. Agree to write for free. This may be for an organization whose mission you support, or for a friend who asks nicely, or maybe even, wait for it, for the exposure (yes, I know, people die of exposure). Though I agree that writers should be paid for their work, there are some good reasons to write for free and in the early stages of a career (or when switching niches) it may be the quickest route to steady work. It can also be thought of as a writing exercise (making your writing stronger) and is sometimes just a nice thing to do. Make wonderful friends. These may be fellow writers, or people who have found and appreciate your work. These people will help you work through issues, both professional and personal. The power of the written word is tremendous. When two people connect over a story, that moment one says, “Me too!” is magical. It keeps writers writing and readers reading. We all want to know that we are not alone in the world, that others share in our experiences, even if they do so from afar. Be glad you took this path. It has its ups and downs. The rewards are often intangible but real. Even if you can’t quit your day job, you know you can make a difference. You know you are part of a special, not-so-secret club. You know the power of words, and how to wield them. 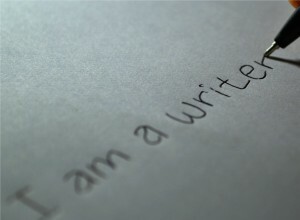 You are a writer.